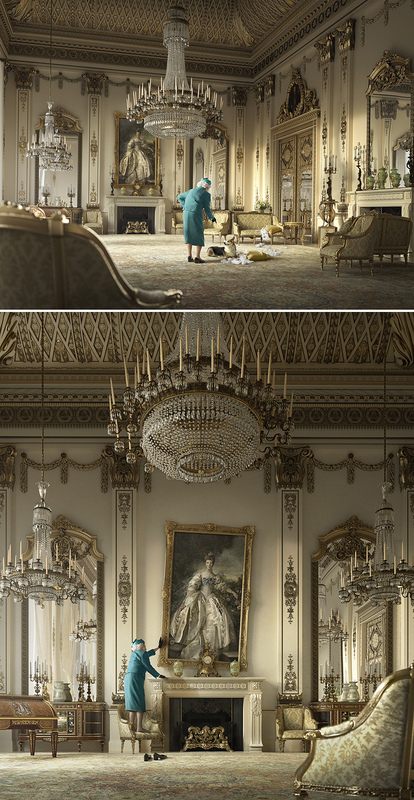 After weeks of planning and countless hours in post-production (this entire room was created in CGI), my collaboration with the incredible Robert Frolich at Filtre Studio on our “Queen For A Day” series is almost complete. It’s part of a bigger project that we call “Lesser Known Moments in History” that will feature famous people in unexpected situations. None of this would have been possible without the fantastic team that helped pull it all together.. Thank you Hannah Soto for producing (“You want a queen and some corgis? No problem!”) Lavi Toma for props and wardrobe (“I couldn’t find the perfect queen hat, so I made one”), Kasha Rodig (“I think I may be able to re-style this wig for your next Einstein Series”) and of course my two (?) right hand men.. Jack & Tom (“I’ll stand-in AND wear the wig”).